It is not hard to tell that American composer Gregory Kyryluk absorbed a lot of old-school German spacemusic in his formative years. We can be thankful he did because, along with fellow Americans artists Jonn Serrie and Spacecraft, he's grown into one of the world's most sensitive practitioners of ambient spacemusic. It is not hard to tell that American e-musician Gregory Kyryluk aka Alpha Wave Movement absorbed a lot of old-school German spacemusic in his formative years. We can be thankful he did because, along with fellow American artists like Jonn Serrie and Spacecraft, he's grown into one of the world's most sensitive practitioners of ambient spacemusic. AWM has taken the classic Berlin sound across the Atlantic and into the 21st century without succumbing to either brazen recycling or moving it too far from its sonic roots. 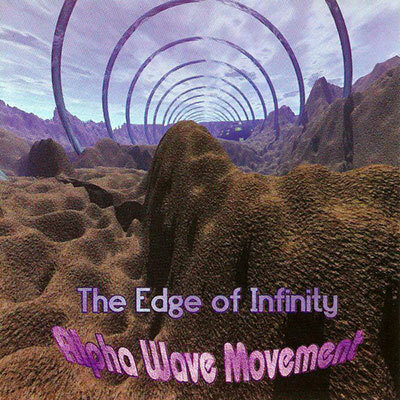 Alpha Wave Movement's album catalogue is extensive; here are seven must-haves for genre fans. Kyryluk hit his creative stride with his second and still greatest album Edge Of Infinity (1997), a work so exquisitely spaced out it could have been piped in from the other side of the Milky Way. The fundamentals of the European/Berlin old-school are all there - deep melodies and chords, a lightness of touch, and rhythms and pads that gently throb and pulse and skim across your consciousness rather than kick straight out of the mix. To these basics Kyryluk applies his own considerable imagination, not to mention some better music technology than possessed by his forebears. The short but epic title track builds beautifully until two layered melodies cry and sigh across the heavens in perfect symmetry. "Travel Into The Nexus" pulls you into a mystical ceremony of eerie vocal swells and hypnotic tones, with the slow motion pulse of tom-toms providing a brilliantly simple backdrop. Drifted Into Deeper Lands (2000) is, as the title suggests, more landscaped and less concerned with cosmic themes. The tracks are longer, their structure a little less defined, with chords extending over longer arcs and sometimes under laid by raw, drifting percussive loops in the environmental style of Steve Roach. This is territory trodden many times by American electronic composers yet Kyryluk avoids the cliches by using a sonic palette that is largely his own. Another successful variation on Alpha's earlier sound is the superb collaboration Bislama (2001). Asian percussion sounds and the alien buzz of Jim Cole's harmonic throat singing all blend beautifully with layers of drifting, morphing synth chords. Both albums intrigue with their departures from the pure spacemusic template, while still retaining that sense of awe and reverence that marks Alpha Wave Movement's best work. A Distant Signal (2002) returns to the extra-planetary themes and spaces of Edge Of Infinity. But gone is some of Infinity's prettiness and in its place is a certain sense of melancholy and loneliness, like the floating strings and dislocated bleeps of "Liquid Cosmos". There is a complexity to the drum patterns on "Outward Bound" that most spacemusic composers rarely bother with, but Kyryluk can be bothered and emerges with one of his most distinctive tracks. For sheer enveloping warmth "A Place Of Peace" and "No Mans Land" are the album's highlights. A kind of companion album to A Distant Signal is Myriad Stars (2011). It segues effortlessly between busy sequencer patterns and beatless widescreen drones, its moods ranging from dark, ominous abstraction to warm celestial melodies and choral harmonies.. The late-career effort System A (2015) captures the full range of his signature AWM sounds in glorious fashion. The album is book-ended with two beatless abstract pieces, floating on a gentle, weird dissonance that keeps changing shape but never gets oppressive or heavy in tone. There are a couple of Kyryluk's beautiful and distinctive space cruisers in a languid tempo, one with intriguing jazzy modulations and a slightly odd-sounding chord pairing. Best of all is “Journey The Existential Plane”. This euphoric 9-minute blast of ambient trance with prog rock trimmings scales the heights of peak early-80’s Tangerine Dream; those moments when they locked in 3 or 4 simultaneous melodies with hypnotic perfection. In a novel twist, Kyryluk also conjures a layer which sounds like funk bassline played at double speed, yet he makes it sound as light as a feather. And finally, there is the surprisingly good archive collection The Regions Between (2007). It wouldn't be accurate to call this an album of out-takes. Its more a case of some genuinely good unreleased tracks that didn't quite fit the albums Kyryluk was recording at the time. As a collection it’s not entirely cohesive but it does show the composer’s deft hand at different styles of spacey electronic ambience: the melodic celestial throb of the Berlin-school, the romanticism of Vangelis, drifting environmental soundscapes with a cosmic air. Even when the music steps beyond expected rhythm patterns on the deeply gorgeous "Solar Dub", the gliding synth below and sparkling arpeggio above make the track unmistakably his own. Aside from the seven albums above, also recommended for Alpha fans are Kyryluk's excellent throwbacks to old-school analog synth music as one half of the duo Thought Guild.